Hydrating granules which absorb over 80 times their own weight in water. 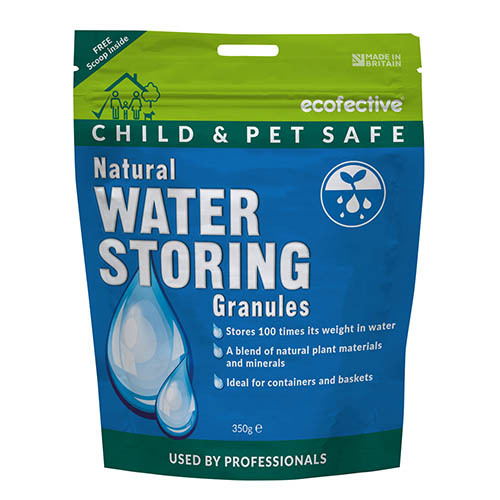 Child, pet and bee safe, ecofective Natural Water Storing Granules are a starch based hydrating granule which absorb over 80 times its own weight in water. It then forms a gel around root systems that releases water to the roots and reduces the need for watering. It is biodegradable, non-toxic and odourless, retaining both water and nutrients, ecofective Water Storing Granules contain no harsh chemicals and are safe to use around children, pets and beneficial insects including bees. Ideal for hanging baskets, pots, tubs when planting out, potting up, transferring into gardens from pots, perfect for draught periods. Simply add the granules to the soil before planting. Ideal for hanging baskets, pots, tubs when planting out, potting up, transferring into gardens from pots, perfect for draught periods. 1 heaped scoop = 5g approx. When used in compost or potting mix then mix the applications in well, water and wait 20 minutes before using for planting out.